I bring you a vintage floral pattern that I hope you love as much as I do. I discovered a new side of my creativity: I love making flowers and birds. They are prints that are very laborious, I will not deny it, but the result is charming and it is very easy to give that “flow” that I look so much in the prints. I like to use a lot of the pen tool, it gives it a very rustic and authentic illustrations. At first I used only for sketching and then draw on. But I’ve grown fond of it! If you also combine it with a watercolor brush, the result is magnificent. I try continuously that the prints that I offer have versatility and can be used in different seasons, surfaces, products, fabrics, etc … And in this case no less. When you see the photos that I have uploaded, you will immediately understand it. TIP: I like this slim fit style for this pattern. You can mix it with pinks, blues and even tiles. Beware of dresses with peter pan collars or buttoned in front. We do not want to look like a granny gown! TIP: I’ve never delved into the world of home textiles, decoration or wallpaper, but in this case I see many possibilities. Whether for curtains, a wall or a sofa. I leave this photo too for you to verify the result yourself. A white background instead of cream is also a good option for this pattern. Find each element of the files separately, can change the background, flowers repaint or change the layout. 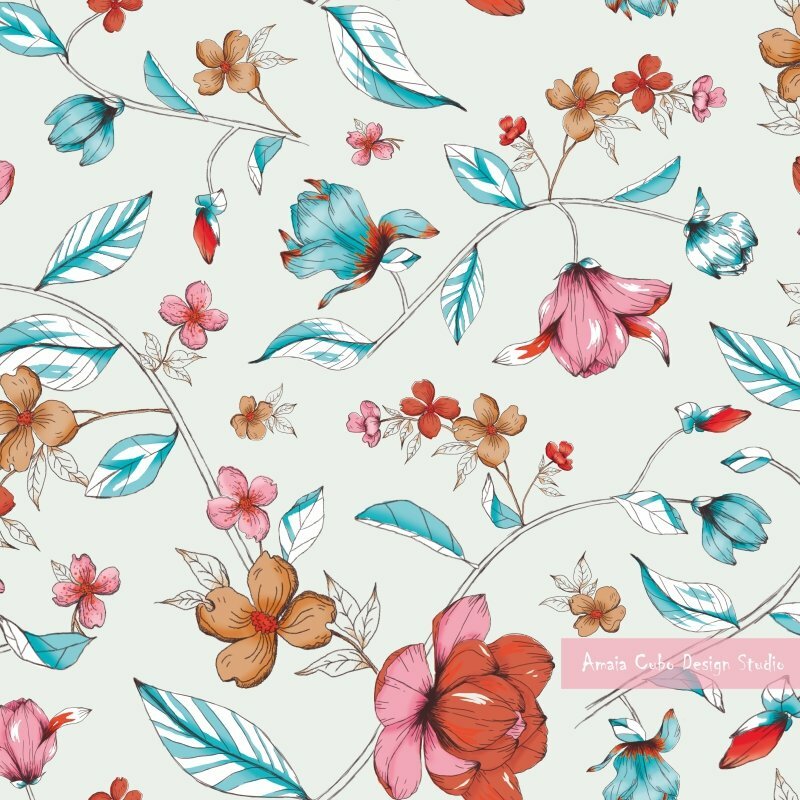 Vintage floral pattern is ready and for sale in the shop, so … Get it! Kisses for everybody and see you next week!